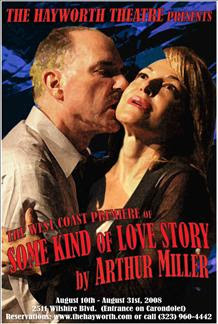 "SOME KIND OF LOVE STORY"
LA WEEKLY ~ GO! "Beege Barkette is endlessly fascinating as the mercurial, protean Angela, and Kehler provides an admirable foil as an ordinary guy trapped on an emotional roller coaster." LA TIMES "Watching America's fiercest stage moralist play with hard-boiled conventions has its curious pleasures..."
FOR RESERVATIONS, click on the title link or call (323) 960-4442.